August recruitment cycle will include 450 Hesder students, with huge majority headed for combat. The IDF's August recruitment cycle – the year's largest – has begun. About 450 of the recruits are Hesder yeshiva students, who serve in the military in several stints, intermeshed with periods of Torah study. Eighty five percent of the Hesder students are destined for combat units – a percentage much larger than in the general population. In addition, a disproportionate number of them reach command positions and become officers. 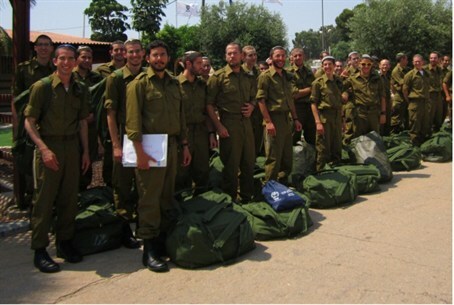 The Hesder students joined infantry brigades Golani, Givati, Kfir, Nahal, Paratroopers and Combat Intelligence, as well as the Armored Corps and Navy. As their enlistment date approached, they attended study days in which they received explanations about religious soldiers' special needs in the army, and how to deal with matters of kashrut, fast days, Shabbat eruv and other matters. The August Hesder cycle is mostly made up of Hesder students who have completed two years of study and are over 20 years old. This year's cycle has an unusually large number of married men.